It’s Friday the 13th, which is the perfect day to review Robert Louis Stevenson’s The Strange Case of Dr Jekyll and Mr Hyde. I have a confession to make. Before reading Robert Louis Stevenson’s The Strange Case of Dr Jekyll and Mr Hyde, I thought Dr Jekyll was the monster and My Hyde the normal human being. My assumption was based on the names, as to me Dr Jekyll sounded a stranger and more dangerous name than Hyde, with apologies to anyone reading this whose name is Jekyll. I didn’t like this story at all. I know the story was cutting edge in it’s day (1886), shocking and frightening Stevenson’s audience. I know Stevenson was hailed as a genius and was enormously popular. I like being frightened when I read, so I know my opinion is based on being a reader from a different time and place, rather than on the quality of the story or the writing. It seemed to me that the story, although very short, was never going to get to the point. There were too many words and the descriptions and the character’s sentences seemed to go on and on. (I know, I know, different time, different place). I was already familiar with the story of the good doctor who had an evil side (although I still got the names around the wrong way when I decided which was good and which evil), but I just didn’t feel the horror. This may have been because the evil events in this book aren’t as graphic as what can be seen on the nightly television news, or in a movie or a read in a Stephen King novel. To sum up the story, Gabriel Utterson, who is a lawyer and a friend to everyone, including Dr Henry Jekyll, comes to know of Mr Hyde’s evil nature and deeds after making out a will for Dr Jekyll in favour of Mr Hyde. 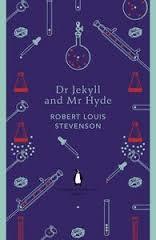 Mr Utterson meets Mr Hyde soon after hearing of him and finds him repulsive. A year later, Mr Hyde is seen beating a man to death. Another of Mr Utterson’s friends dies of a shock, due to something he knew about Dr Jekyll, who has retreated from society. Eventually Mr Utterson and another man break into Dr Jekyll’s laboratory to find Mr Hyde dead on the floor, wearing Dr Jekyll’s clothes. Letters to Mr Utterson revealed Dr Jekyll had been using potions which turned him into Mr Hyde, so he could indulge in his taste for killing and hurting others, and then turn back into the good Dr Jekyll. Changes to the available ingredients for the potions meant that Dr Jekyll was permanently becoming Mr Hyde, and so Dr Jekyll suicided. The blurb on the back cover says that this book “gave birth to the popular idea of the split personality.” I’m sure the idea that people can be nice one day and nasty the next wasn’t really new, even at the time this book was written. We all have a dark side, although some people’s dark sides are blacker than others and we all hide our dark sides to get along in society. I suppose the naming of the condition was new though. I feel a bit of a failure for not reading and loving Dr Jekyll and Mr Hyde, but since I loved Treasure Island, I’m sure I’ll get over it.